RETIRE IN STYLE BLOG: Paying the Price for Living in Paradise ... garbage! Paying the Price for Living in Paradise ... garbage! I like a blog written by a solo woman traveler called Hole in the Donut Cultural Travel. It is a very serious blog about sights and sounds of foreign countries. She tells it like she see it. That is good...if it is bad or boring or dirty then I want to know. She will tell you. That is where I saw the post about garbage in third world countries. It turns out I have an opinion! Garbage/litter/trash/filth is not my favorite subject but it seems that it will draw your eye faster than any beautiful sight. 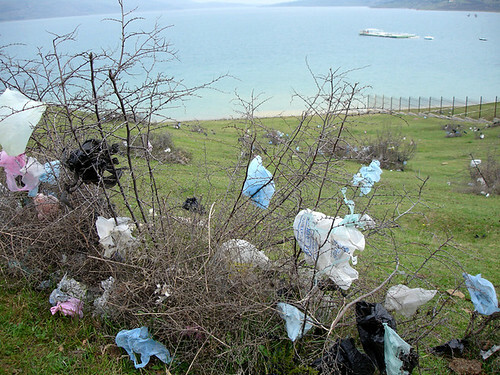 That is why we crop litter in the foreground from our photos. But it turns out that in other cultures it does not even raise an eyebrow. So my husband and I spent 4 days finding the exploring San Carlos and it's back roads. We came home with a car that looked like it had driven down the Baja on dirt roads for several days. Here is what we found. Nothing is free...PARADISE comes at a cost to someone. In this case, the cost may be to the Mexican people...I am not sure. The road from Nogales taking the truck route around the city is a toll road all the way from the border to San Carlos. Locals and the Mexican trucking industry pay dearly so those roads can be maintained. I suspect that most locals are taking back roads to avoid the cost. The first toll as you enter the country is $11. Really! Back roads are paved if they are a main road to somewhere. Maintenance on them is minimal. If they are country roads or even back streets in town they are not paved. In San Carlos, the roads to the snowbird neighborhoods are paved but all other roads are dust. Then there is the garbage. It just grows and flys everywhere. There is a garbage bag hanging from every tree. I will say that at least San Carlos does not have dogs wandering free like they were in Puerto Penasco the last time we visited. A burning barrel becomes traveling garbage when dogs tip them over. Those people that visit San Carlos must have waste disposal of some kind but if you go even a few streets away from the center of this snowbird community, you will find the garbage strewn in the yard or tossed over a bank. Hole in the Donut said children pointed out that banana peels and orange rinds do not hurt a thing. They go back into the soil to make it rich and the oranges sweeter next year. I agree totally. Composting is a very good thing. The smell of rotting vegetables should not offend anyone but piling it close to the house or on a city street attracts rats and worse. But in our "use it and toss it" world, it is the containers that are burying third world countries. They have caught onto our luxurious food in styrofoam packaging and plastic grocery bags but don't realize or care about disposing of any plastic in the proper way. In our country we are hiders of waste. The garbage in the state of Oregon is transported from the Portland metro area to a huge disposal sight about 2 1/2 hours from the city. It is sorted, buried, composted and heaven knows what else. But the point is, we never see or smell it again. It is very costly for us and communities are doing everything to reduce the amount that needs to be taken away. What is the point? While I do not like to see the garbage and tires tossed over the hills and people living in squalor, I have to admit that we are not much better...we just put waste where we cannot see it. The snowbirds that are living the cheap life on the Mexican dime are dreaming if they think that paradise doesn't come at a cost. We pay the price in the United States for the services we receive. But who is paying for the infrastructure in Mexico if the snowbirds have it so good? Could it be the country is suffering a lot of damage that is invisible? Snowbirds build around travel trailers! As an afterthought I need to say...I think we missed the point of the "global warming" discussion. It really doesn't matter if climate change is our fault or not. The message was...PLEASE QUIT MAKING OUR PLANET INTO ONE BIG GARBAGE DUMP!